Part-time jobs are quite usual these days. Employers can hire part time employees whenever there is a need instead by paying more to a full time employee. The reasons for hiring part-time employees are plentiful. Since, the reasons are innumerable, we often tend to hire average or unsound people who lack in the minimum requirements, that are necessary for a good part time employees. When recruiters do not focus on the job hiring division, they have to face the consequences which show up in the quality of work. It’s also important to understand that the candidate selected is both skillful and also reliable in terms of work. Few minutes of conversation with the candidate, might not be sufficient, to analyze and draw a conclusion whether the particular candidate is worthy for the position. The hiring process is considered to be the most challenging and crucial part. The quality of the output is determined by the skill of an employee. The recruiter should be able to review the candidates and choose the right candidate with the right profile. Here are few exceptional points to be considered to accomplish the hiring task with ease. The following mentioned are few employee hiring tips to find employees who are looking for a part-time job offer. Questions are the only way to judge a candidate’s profile. Recruiters generally skip this phase and ask most common questions which do not accurately help you, to check the caliber and potential of a person. Prepare meaningful questions, that helps to understand about the employee’s proficiency and accomplishments. Background check for employees is usually been overlooked by most of the employers when it comes to part-time job recruitment. The hiring division doesn’t focus on this issue due to few reasons such as less time, recruitment through referrals or sometimes due to their ignorance. This may lead to problems that makes employers regret later. Background check is a primary thing which has to be taken into thought. Frequently people misrepresent fraudulent data by giving false credentials and fake endorsements. Due to the fraudulent data presented, the quality of the work submitted would probably decline than expected. Sometimes, the business dealt might contain confidential information which has to be protected by the workers who are working with it. Thus, it is really mandatory to perform a background check on the employees before recruiting them. This background check can be done in many ways. Here are the two methods which are commonly used to check the background of a person. The verification of educational records is considered as the most basic way of checking a candidate. It’s important to consider this check, as more number of applicants try to falsify their resumes, to have an edge over other employees. Driving records are required to understand that the candidate doesn’t possess an immoral and illegitimate profile. In this check if you find the candidate is suspicious then you further go for criminal record check, if necessary. Social networking can benefit us to a larger extent by helping us track accounts. We have the technology with enormous number of users and fastest exchange of text, photos and videos. There are many social networking sites, where the information and the work experience of the user will be easily available. Try to use the information for the business purpose but do not misuse it. The knowledge obtained from books is never sufficient. Knowing is different from understanding and learning is different from implementing. Always take time to check the experience of the employee as experience gives the competitive edge. Considering experience is also one of the best ways to check the caliber of a candidate. Candidates with work experience can be hugely beneficial to the business as they have faced the practicality and dealt with complications in advance. Therefore, the work experience of the candidate, helps us understand that the employee is ready to face the real world of work without much difficulty. Sometimes, you may find people without an educational background but still you can consider their application if they have a previous work experience. The previous works of the employee should be reviewed properly. There is also a chance that the employee misrepresents his work. It is important to ask the previous works of the employee and even question about them. Questioning about their previous task is vital and also valuable because questions could be answered by the candidate only when he has put his knowledge and efforts into it. Any person who has given fake work experience could be easily found out and can be eliminated without a second thought. When a person has strive hard and placed his efforts, he would be able to answer about his previous works. Experience is required but at the same time it is important to provide job opportunities to new ones. Technology is evolving at a breath-taking speed and new people can easily adapt themselves to the new technologies. An inexpert doesn’t demand you for the compensation and they are the ones who work for you for a cheaper price reducing your labor cost. A fresher can be more energetic and also enthusiastic towards work. Since, they do not have work experience, they tend to work harder to meet the deadlines and complete the task given. Therefore, it is good giving opportunities to new employees and it’s also equally important to have experienced people to guide the new ones. It would be a good combination to have both new employees and also experienced. Understand the interest of the candidate. It’s a well-known fact that people who work in project which interests them produces better results. Candidates who are passionate and eager to work are the ones who can fulfill the given task. It is the work of the recruiter to understand the interest of the employee and assign the task related to the interest of the employee. 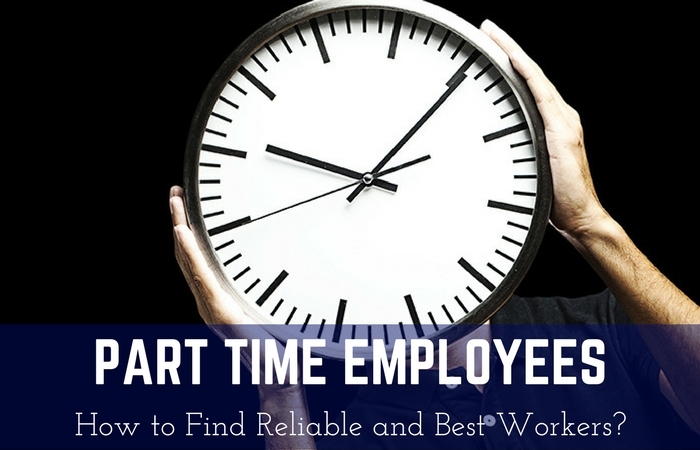 Part-time workers generally choose a specific area which relates to their interest and hope to earn and there are also other kinds of people who work just for the sake of earning extra. Understand the difference between the two. If your work is related to creativity, money alone can’t drive the candidate to work. Person who works with passion and interest is required to complete the work assigned. If your business is not related to creativity and doesn’t require much passion towards work then money alone can make the person complete the job. Therefore, select a candidate who suits better to your requirements. The person might not always have the necessary knowledge required to complete the given task. In such case the person has to learn more in order to complete the task. Analyze the candidate’s potential and also analyze the candidate’s interest to learn new things. Most of the people like to do the same work which they are good at and comfortable with. They do not just want to adapt to new ones and strain themselves learning new things. Differentiate such people from the others, if your business is related to the knowledge of the subject which keeps on updating. When the candidate is not willing to learn extra, then the organization faces problems in losing their valuable resources like time and money. Do not regret later by choosing the candidates who do not want to leave their comfort zone. Communication also plays a vital role in hiring an employee. If the employee is capable of doing an assignment but incapable of understanding the instructions given by the instructor, then it’s no use of hiring such employee. Communication is equally important with the required skill set, when hiring employees. Since this a part-time job and there is limited amount of time, time cannot be wasted by clearing petty issues which are faced due to miscommunication and misinterpretation and lack of basic communication skills. Though your business contains major part of communication or no part of communication, make sure that the employee is able to communicate properly and understands the requirements provided to complete the task. Listening is an art. Listening skills are considered essential as it eliminates the misinterpretation of message. The person who is not willing to listen is also not willing to learn. The person doesn’t listen to other person, when he feels he knows it before. This attitude of a candidate will never help to learn anything because the person is already in an illusion that he knows everything. Therefore, it’s important to check the listening skills of a person. This can be done by carefully observing the answers given by the person to a particular question. The person who do not posses listening skills will always try to interrupt while speaking and tries to answer the question, before it’s completion. Due to interruption, candidate misses a lot of information and misinterprets the provided information. The result of this would be a low-quality output and time of the organization is wasted due to failing in simple listening skills. Application filtration is considered as a stressing task. There might be many irrelevant applications and it takes a lot of time for you to choose the right ones. In this case, you can make your job much simple by setting up an automated application system that can be used to filter the applications. You can filter the applications based on all criterion such as age, gender, qualification and even experience. Applicants who do not satisfy the required criterion will be dumped out and only the required ones would be shown. This would be helpful when you have heaps of applications and you need to select a few. There might be many people who are willing to work but they do not have enough time to spare in their schedule. People might be occupied with their full-time work and are exhausted when it comes to part-time. As they do not have abundant time to complete the assigned task, they rush up to complete the task. Trying to do things good but doing it within the required time, shows impact on the quality of the product. Their main focus would be on completion of the task rather than the quality of the task. This would produce low quality result and shows a lot of impact in the growth of the company. In order to avoid such mistakes, help the employee to understand the load of work and the amount of time given. Ask them questions, about time management. Explain them the consequences that will be faced due to the low quality products delivered by the employee. By explaining, the employee tries to think whether he can really manage all the things together or should quit and give chance to another employee. Candidates tend to be more reliable when recruiters explain the disadvantages, that the candidate and the company could face due to lack of time management. Thus, the schedule of the employee also plays an important role for the success of the organization. All of us have read many stories on positive attitude and all of know how positive attitude impacts our work and behavior. Though many people are quite serious in part-time jobs at the beginning, the interest gradually decreases day after day. Part-time job is always an optional job to all and whenever the difficulty in job increase people tend to stop working as they will be unable to work in the tedious tasks. This attitude of people is quite common and should be recognized before in hand. This can be recognized by giving a sample task for the person, without any payment. This is going to help the candidates understand the workflow of the job. Once they experience the difficulty in work, they will be able to make a decision. The one’s with positive attitude would step further and prepare themselves to take much more challenges and the people with negative attitude would step out silently. All the mentioned points give you a clear description of how to hire reliable part time workers. Hope this is beneficial to you.